Motion Control expert, Stober Drives, has used products from its own range to design and build a robotic component mounting system to manufacture the new LeanMotor encoderless drive. The LeanMotor is a brand new energy-efficient drive system that Stober says, “bridges the gap between a synchronous and an asynchronous drive”, which means engineers can now upgrade their drives to servo motor efficiency without the extra costs associated with the specification of the higher spec asynchronous drive. 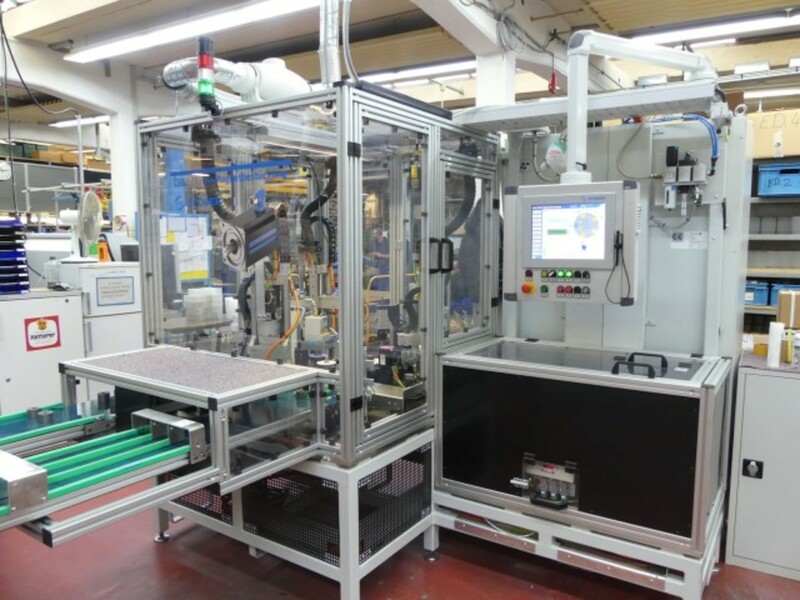 The new automated production system used to produce the LeanMotor, couples Stober’s newest technology with their existing Stober AS6 Automation Control Suite. This highly cost effective piece of production plant has enabled them to significantly streamline their manufacturing processes. Heiko Berner, PLC product manager at Stober, along with colleague Heiko Bismarck, Stober’s product trainer and supporter, worked together to produce the innovative new automated system. Berner explains: "For the production of the round blanks for the new LeanMotor, we developed a fully automated mounting system that consists of three SCARA robots and a rotary indexing table with five stations for the individual processing steps." To handle a total of 16 axes safely, Stober used their own SI6 double-axis drive controller, which, including the PS6 supply module, only requires a width of 405mm in the control cabinet. Their low backlash planetary and helical bevel gear units are used to deliver the high degree of precision and repeat accuracy required, particularly for the axes in the robots and the rotary indexing table. These are controlled centrally using the Stober MC6 motion controller, which is ideal for synchronised control over EtherCAT and handles the entire human-machine interface in this process. All calculations for path planning and interpolation of the three robots also take place centrally. Heiko Berner continues: "We have kept the interfaces as simple as possible for the application programmer, so that the robots can be positioned directly using Point to Point (PtP) and if necessary, use taught positions in the program sequence." This new automated manufacturing system is easy to use and its integral visualisation provides all the information the operator needs. There is also a language selection option which ensures that operators can adjust and customise the machine using the ‘settings’ option on the integrated touch panel. Stober’s AS6 AutomationControlSuite development environment includes all the functions contained in CODESYS V3 for motion control and for programmable logic controllers. For program creation, high-performance Drive&Motion libraries were used to significantly reduce the programming requirements. In this system, format management is used to enable users to quickly change to a different round blank format and the controller makes it easy to see which machine parts need to be substituted for the particular manufacturing operation or process. The motion controller operator also has access to videos and PDF documentation if required work involves more extensive conversions. A trial version of the Stober’s AS6 AutomationControlSuite is available to manufacturers at no additional cost and comes complete with many application examples that provide insight into the implementation of format management, as well as operating menus and the structure of extensive alarm management. The new fully automated robotic component mounting machine built by Stober consists of four stations. The first is a 4-axis SCARA robot that places the round blank on a holder or removes this part from the rotary indexing table in the finished state. The machine is loaded and unloaded using two buffer zones made up of conveyor belts. At the second station, another robot places the correct number of additional magnets and positions them in station three, ready for the next processing step. The third SCARA robot applies a fluid mixture in station four. Here, it is important that the quantity of the material and the linear path are compatible and is the only way to ensure an optimal result, even in the event of varying blank sizes. The system performs an automated measurement for this and corrects the path accordingly. An explicitly linear path is travelled here, while, at other points in the machine, path planning independently calculates the fastest route between two points in space.